Almost a quarter-century after Nelson Mandela led the African National Congress to power at the end of apartheid and the world heralded the birth of the ?rainbow nation,? South Africa stands at a crossroads. As delegates of the ruling African National Congress meet this weekend to choose a successor to President Jacob Zuma as party leader, they face a clear choice: his ex-wife, Nkosazana Dlamini-Zuma, who favors the president?s push for ?radical economic transformation? to redistribute wealth to the black majority, or his deputy, Cyril Ramaphosa, who?s pledging to fight corruption and revive a moribund economy to cut a 28 percent unemployment rate. The leadership conference comes as Zuma?s immersion in a succession of scandals is eroding the 105-year-old party?s support to such an extent that it?s now at risk of losing its majority in 2019 elections. The run-up to the vote by 5,240 delegates that?s scheduled for Sunday and is too close to call has caused deep rifts in the ANC, weighed on the rand and nation?s bonds and unnerved investors seeking political and policy clarity. ?What?s really at stake now is the future of South Africa, not just the ANC?s continued governance of South Africa ? everyone needs to understand that,? David Makhura, the 49-year-old premier of the nation?s richest province, Gauteng, where an overwhelming majority of ANC branches back Ramaphosa, said in an interview Tuesday. ?Even people who don?t vote for the ANC are hoping that we will make one move that will bring South Africa back on track.? 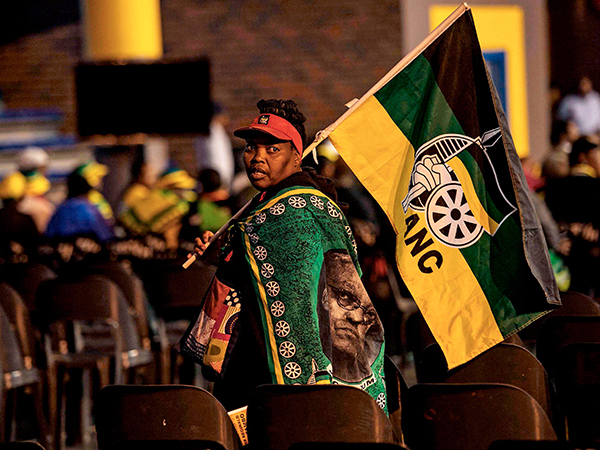 Support for the party slipped to an all-time low of 54 percent in last year?s municipal elections, from a peak of almost 70 percent in 2004, and it lost control of Johannesburg, the economic hub, and Pretoria, the capital, to opposition coalitions. Fifty-nine percent of 2,100 people who said they?d voted for the ANC favor Ramaphosa to take over as leader, while 19 percent backed Dlamini-Zuma, a computer-generated poll published this month by survey company RatePop found. The party will probably struggle to retain power in 2019 with her at the helm, according to the survey. ?This is a make-or-break situation for the ANC,? Sethulego Matebesi, a political analyst at the University of the Free State in the central city of Bloemfontein, said by phone. ?I think for everyone, it will be good if Cyril Ramaphosa wins. It will give hope to the country and to the international community as well.? The ANC leadership has refrained censuring Zuma, who was found by the nation?s top court to have violated his oath of office by refusing to repay taxpayer money spent on his private home and who?s been mired in allegations that he allowed members of the Gupta family to influence Cabinet appointments and the awarding of state contracts. The party has, however, acknowledged that it?s struggling to stop corruption and infighting. ?We seem to have lost the moral standing we once enjoyed in society,? the party said in a document circulated to delegates ahead of the conference. ?Staying in power depends on correcting our weaknesses and delivering to voters.? Ramaphosa, 65, is a lawyer, former union leader and one of the wealthiest black South Africans, while Dlamini-Zuma, 68, is a medical doctor who served as minister of health, foreign affairs and then home affairs, before doing a five-year stint as chairwoman of the African Union Commission. She and Zuma divorced in 1998. Izak Odendaal, an investment strategist at Old Mutual Multi-Managers, which oversees assets worth about 100 billion rand ($7.4 billion), expects the rand and South African bonds to strengthen should Ramaphosa win and the opposite to happen if he doesn?t. ?There is definitely a bit of binary perception that Dlamini-Zuma stands for the status quo and Ramaphosa represents some sort of positive change,? Odendaal said by phone from Cape Town. ?The bottom line is that whoever is the new ANC president will face certain constraints in terms of their ability to make, change and influence policy. ?